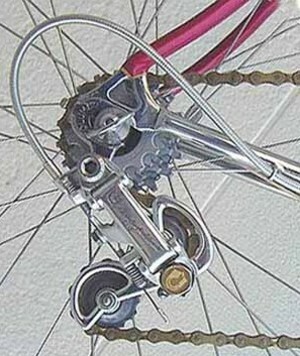 Bicycles rely on steel cables to pull the front and rear brakes and the front and rear gear changers. Cables have long been used to transfer force when pulled, but bicycle cables have to transmit force even though they don't pull in a straight line. Bicycle cables go around corners and curves, and pull by the use of a cable running through a flexible cable housing that is anchored on the frame at both ends. The housing is made of coiled steel with a rubber covering. This cable system was invented by Frank Bowden, and patented in England in 1894. Bowden had made a fortune on the stock market in England, and bought a bike, then bought the company that made the bike. He turned the bike company into the Raleigh Bicycle Co., which still makes quality bikes 100+ years later.